Snapchat is the knock-knock joke of social media. It’s the one-liner of the party. To date, it’s the only tool that boasts the ability to face swap with your dog. But before you chortle and control-tab your way to another site, you should also know Snapchat is serious business. In the span of a year, its audience grew 400%. Video views reach billions daily. Here’s Snapchat in a snap. Your best bets are millennial candidates who are in the early stages of their career. Or you’re looking for soon-to-be or recent college graduates for an amazing internship opportunity. Utilize its high-level engagement to develop your (and your agency’s) online brand. Snapchat is best for recruiting efforts that are creative and novel. Don’t just direct potential candidates to a website. Start conversations with them. Keep it fun and whimsical. Post an ad that gets a smile even if the role you are filling has serious responsibilities. Create a timeline for content and publication. Tell a story with your day’s images. Plan it out with storyboards. Keep Snapchat stories to 1-2 minutes. Manage any obstacles with productive Internet research. 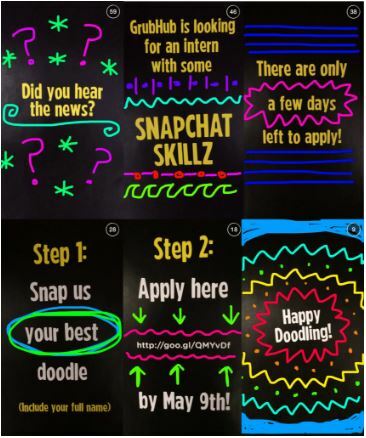 Here’s how your recruiters can make the most of Snapchat. A takeover is a term that describes when an individual is given control of a company’s social media channel to share content. Takeovers are great ways to expand your network. Snapchat leads with fun, and fun reads well across all social media platforms. 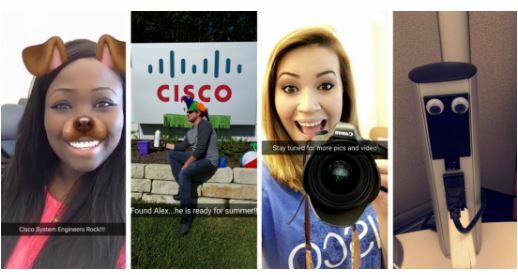 As part of their employer branding efforts, Cisco took their #wearecisco campaign to Snapchat. Develop a story arc. The content is available to view in sequence and for 24 hours. Highlight the most interesting parts of daily routines. Amuse your audience! Approach with a sense of humor. Engage with others–co-workers, candidates, leaders, etc. Before it disappears, save the content of everything you made during the takeover. Companies like Goldman Sachs, J.P. Morgan, and Taco Bell are using Snapchat when they need Millennial talent to fill their ranks. Everlane has a strong Snapchat presence with 500 views per Snap. Fans of the minimalist clothing retailer can submit a 60-90 second Snapchat story to apply for any open role. 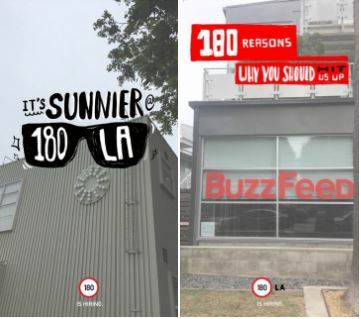 180LA’s used Snapchat’s On-Demand Geofilters for Business to make a game-changing recruitment move. They established Geofilters at their competitors’ offices. They received 40 replies in one hour. Avid Snapchat users can create On-Demand Geofilters for private events as a way to share the experience of an event with friends and family. Snapchat introduced On-Demand Geofilters for Business in early 2016. Companies like Disney use branded Geofilters as a way to increase interactions with their fans. There is a review after submitting your order. Once approved, you will receive an email confirmation. Filters are additions that users can add to their snaps. They essentially look like emojis that are a little more dynamic. These include text and drawing features. Go ahead…take a snap of your coffee and draw a heart around it. Lenses are one of the most fun features on Snapchat. It’s what you would use to swap faces with your dog…or turn yourself into a dog. Geofilters are location specific filters. They’re only available in a certain area, and sometimes, for a specific amount of time. This is essentially the currency of Snapchat. This is the video or photo you take to share with friends, family, and colleagues. Snaps disappear as soon as others view them. Each user has a unique Snapcode. These unique IDs allow people to quickly friend each other. Snapchat Stories are snaps that are connected together to create a sequential narrative of your videos and images. Stories are available for 24 hours. Want to learn more social recruiting best practices? Check out our blog post on recruiting with Instagram.